What Happened To All The Early U.S. Coins? Most collectors of U.S. coins know that Federal gold and silver issues made prior to 1834 are much scarcer than coins minted in later years. Few, however, realize that this situation has its roots in circumstances that existed from the very beginning of the national coinage system. In the late 18th century, the Spanish milled dollar and its fractions were the most common silver coins circulating in the United States. Along with English shillings and pence, an assortment of unofficial and official colonial coppers further filled the need for small change. For large transactions, French, Spanish or British gold pieces were employed. Because of the incompatibility of the different monetary systems, everyday life was burdened with the need for intricate conversion tables. Accounts were, of necessity, kept in both English and Spanish amounts. Confusion was rampant. A more practical system was sorely needed. In formulating their plans, the architects of the U.S. coinage system were eager to preserve continuity between the old and the new. 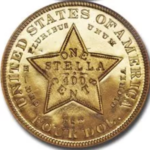 Although they championed decimal coinage as a clean break with Europe’s convoluted methods, one concession to the Old World was made: The basic unit around which the new system revolved was the silver dollar, copying the Spanish coin’s weight and fineness, along with its commonly accepted name. 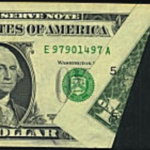 The new U.S. dollar, unlike the Spanish coin with its eight parts orbits, would be divided into tenths and hundredths. It was decided to emulate the Spanish coin as it actually circulated—well-worn, and with an average silver content of 371 grains instead of the 375 grains at which it had been coined. It was customary for merchants to accept coins at their actual weight and they generally valued the Spanish pieces as worth 24¾ grains of gold each. This was close to the prevailing worldwide silver/gold ratio of 15 to 1 and it was on this basis that the planners of the U.S. coinage system proceeded. In 1792, Congress adopted a bimetallic standard and the 15 to 1 ratio, decreeing that the precious metal content of a U.S. standard dollar would be equivalent to either 371¼ grains of silver or 24¾ grains of gold. That’s where things began to go awry. Almost immediately, worldwide economic conditions wreaked havoc with Congress’ plans. By 1795, an ounce of gold—worth 15 ounces of silver in the United States—was worth 15½ ounces of silver in Paris. By 1799, it was 15¾ ounces and that was enough motivation for bullion brokers to buy United States gold coins, mostly with Latin American silver coins, and ship them to Europe to be sold. To stem the tide, in 1804, President Thomas Jefferson ordered that no more eagles be made. By 1813 the ratio would reach 16¼ to 1, and before long, 98% of all U.S. gold coinage would be destroyed. Little gold was imported to the U.S. and even less found its way to the Mint. 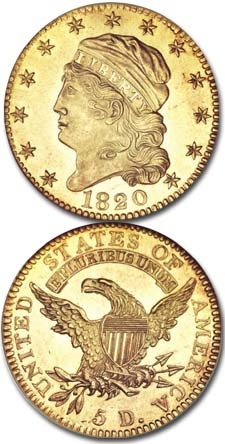 Small amounts of gold did continue to trickle in from Mexico, the West Indies, and beginning in the 1820s, from new strikes in Georgia and North Carolina, but overall, the supply was never enough to allow gold coins to circulate widely. Theoretically, with the ratio favorable to the coinage of silver, U.S. coins of that metal should have been readily available, but other factors came into play. Mint machinery was crude and in poor condition. Steam power, while available, would not be introduced into the Mint until 1816. Most importantly, with no bullion fund authorized by a Congress already strapped for cash, the Mint was unable to keep a supply of coins on hand to exchange for deposits of silver. As most depositors didn’t want to wait for their coins, the amount of silver brought to the Mint was relatively small, but when it did come in, it was expeditious to coin dollars instead of the smaller silver coins which took more time and expense to make. 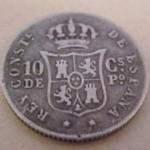 Unfortunately, however, U.S. dollars were accepted as the equivalent of Spanish dollars in the Caribbean, and since unworn Spanish pieces had a higher silver content than the U.S. coins, it became profitable to export the American dollars, exchanging them for the Spanish pieces which were then melted down. All too many dollars left our shores in this manner. In response, as he had done with the eagles, Jefferson suspended production of silver dollars in 1804, and for almost 40 years thereafter, the U.S.’s flagship silver coin was rarely seen. 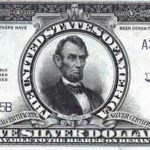 From that point, the half dollar became the pre-eminent U.S. silver coin and was produced in greater quantities than any other silver denomination. 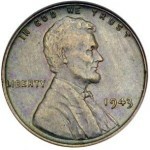 But instead of circulating, the half dollar supplanted the discontinued dollar as the coin most often used for bank reserves and overseas payments. Many were minted from deposits of foreign silver made by the Bank of the United States and that same silver often returned to the bank’s vaults in U.S. coin form. And like the dollars before them, some halves were also exported for use overseas. The biggest problem, however, remained the Mint’s continuing inability to turn bullion into coins in a timely manner. This situation virtually guaranteed that very few individuals would bring their silver to the Mint for coinage. Poor Mint conditions also limited production of the smaller silver denominations—quarters, dimes and half-dimes. Because the Mint could make half dollars much more efficiently than the smaller denominations, half dollars they made. Early Mint records show that only when bullion deposits fell off did the coinage of the smaller silver denominations take place. A Senate committee reported in 1830 that so few quarters, dimes and half dimes were made that the total number of small-denomination silver coins produced since the Mint’s opening amounted to less than one piece for each person in the country. Of the $25 million in silver coins minted since 1792, only about $14 million remained in circulation in 1830, and of that, at least $2 million was sitting idly in bank reserves. It’s now clear that fluctuating silver/gold ratios, Congress’ failure to provide for a bullion fund, exportation, and less-than-ideal Mint conditions all played a part in limiting the availability of U.S. silver and gold coins during those early years. As numismatists, we’re most fortunate that today, the relatively few surviving coins of that era have found their way into our collective hands. Copyright © 2014 Robert S. Koppelman & the Numismatic Guaranty Corporation. All rights reserved.